Plants for dry shade are always in demand and some of the Arthropodium species may just be the ideal plant to try. With eight species, four native to Australia, two from new zealand and two from the nearby Pacific Islands and as far away as Madagascar they do differ in growth habit as well as common name. Renga Renga Lily or Arthropodium (New Zealand Rock Lily) . 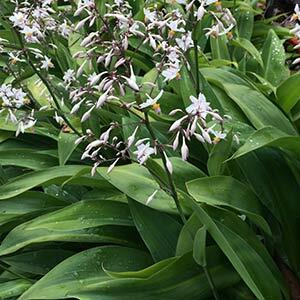 Arthropodium (renga renga lily) are an attractive evergreen flowering perennial. A hardy clumping plant they cope well with a warmer position in the garden. The cultivar that we like is known as Arthropodium ‘Matapouri Bay’ which is a fantastic plant for dry shade. Arthropodium cirratum will reach 60cm to 80 cm with flower spike to 1m, originally from New Zealand. All species are for the foliage as well as the flowers ranging from purple and yellow to a chocolate color which appear during spring to summer. Great ornamental plant in rockeries. Arthropodium are a group of herbaceous perennials plants, only two from New Zealand. Sometimes called the Renga Renga Lily, they do make a great border plant forming a dense clump of sword-like foliage topped with white flower spikes. Grows to 80cm. A. candidum ‘Rubrum’ is the ‘Dwarf Rock Lily’. A. cirratum – Includes the cultivar ‘Matapouri Bay’. A. milleflorum ‘Pale vanilla lily’. A. minus ‘Small vanilla lily’. These two species from Australia have recently been reclassified to a different genus. Best panted in a humus rich soil in light shade. Dig in some well rotted compost before plants. Ensure the position is well drained. Plants should be watered in with a liquid seaweed fertiliser. Additional water may be required through the first summer. Fertilize with a general purpose slow release type in spring. Tidy up,by removing old dead foliage as it appear. Watch for snails, especially on young plants.